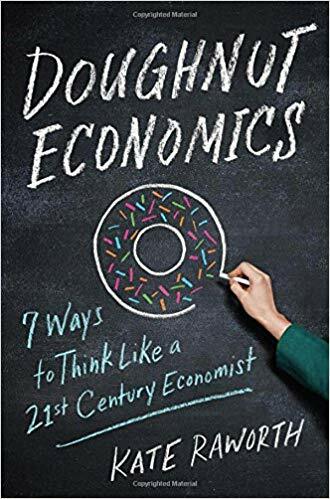 Book review – Doughnut Economics: Seven Ways to Think Like a 21st-Century Economist | Eco-Ethonomics Inc. In her book Doughnut Economics, Kate Raworth illustrates how today’s economic tools use a narrow and dogmatic theoretical framework, which do not reflect the multi-dimensional challenges of the 21stcentury. The teaching and development of economics has lost sight of its goal. The founders of economics, back in ancient Greece described economics as the practice of managing the resources of the home. Over time, the goal has been appropriated to concern itself primarily with economic growth. Raworth proposes a new economic model – depicted in a doughnut shaped diagram. I’ve never found reading about economics to be exciting, but Raworth uses story telling and visualization, to make the book very easy and fascinating to read. She provides a framework for comprehension that is very accessible, even to those with limited economics background. The second half of the book looks into solutions to change the economic paradigm: systems thinking, regenerative design, distributive design, circular economy, and open-source design are part of it. It was inspiring to read that today’s most innovative enterprises are inspired by the idea that “the business of business is to contribute to a thriving world”. Raworth points to the challenge of working with businesses, financial intermediaries and governments that are still trapped within the mindset and metrics of degenerative economic design, driven by short-term return. Even with the rise of social finance, alternative currencies, the state has a role to play and metrics need to change for a mainstream shift to happen. We need to be prepared to be agnostic about growth, which isn’t going to be simple. I would recommend this book to people who are interested in addressing social and ecological challenge and anyone who is looking to challenge the economic status quo.